Just because California has a rep for being filled with health nuts doesn’t mean they don’t love carbs. California boasts some amazing Italian food, from newer places inspired by the latest trends and tastes to classic old-school dives. Take a look at the finest from California’s pasta makers, located in communities all over the state. Chef Bruce Kalman opened Union on Union Street in Old Pasadena and has been churning out handmade pastas ever since. A James Beard winner and a favorite with other chefs, including the legendary Jacques Torres, Union serves up pastas that are not to be missed. Since first opening in the hip Arts District neighborhood of Downtown L.A., Bestia has been a favorite not only in the neighborhood but amongst critics and visitors. Make a reservation well in advance please the modern and creative riffs on Italian classics are super popular. Valentino in Santa Monica has been a favorite pasta spot for decades. Everyone from celebrities to locals head to Valentino for special occasions or just nights when you want some really good food and great service. Once renowned as the best Italian restaurant in the country, Valentino continues to please. For over 20 years, Acquerello has been a leading fine dining destination for San Francisco’s food loving elite, even receiving Michelin stars. Housed in a historic building that was once a morgue, the elegant setting fits the amazing cuisine. If you’re going all out, make arrangements to try the tasting menu in advance of your visit. The menu changes daily but you can always rely on great tastes. Whether you stop in for lunch or dinner, you’ll find a variety of different pasta dishes as well as great appetizers. Oliveto frequently has special offers and dinners and events so check the website before you head in for the latest updates. La Pasta Italia is part deli, part factory. As a factory it makes the pastas for many of the restaurants in the area. As a deli, you can stop in and enjoy some of that pasta, freshly made. A longtime staple in the area, La Pasta Italia is a family owned business with deep roots in the community. Al Dente has a long list of pasta preparations, just choose your noodles. The restaurant is an elegant oasis from the heat of the city and makes for a welcome respite, or even a takeout treat. The upscale casual joint is a favorite neighborhood joint. Since the 70s, The Godfather has been leading the Italian dining scene in San Diego. 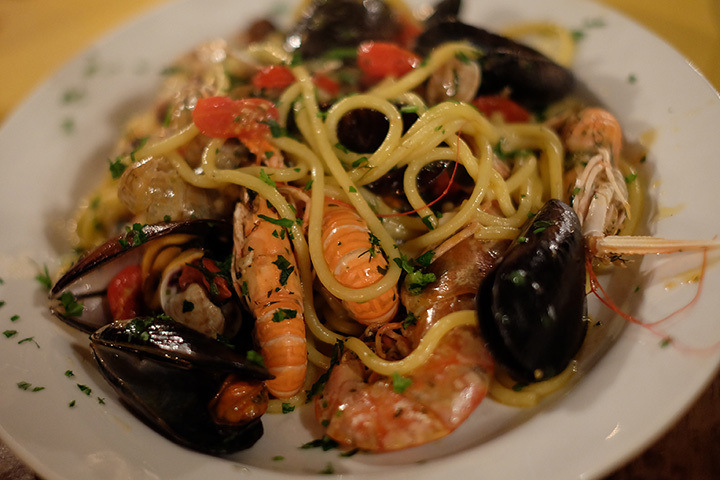 Filled with pasta and Sicilian style specialties, The Godfather offers both lunch and dinner with generous helpings and carefully made recipes. Bencotto has 75 different kind of pastas, so you’ll probably find something that you like. Choose your sauce, then choose your pasta. You’ll find stuffed options like ravioli as well as handmade options and many more. Santa Barbara’s Olio e Limone is tucked away off State Street in a tiny little shopping center. The small space belies the big menu filled with traditional and inspired pasta dishes. Whether you’re stopping in for a lunch while catching the sights or out on the town for a special occasion, Olio e Limone is the perfect spot for any meal.